PRESIDENT Muhammadu Buhari has told the parents of the abducted Chibok girls not to lose hope, assuring that the girls will return to them. President Muhammadu Buhari (standing) speaking during a reception for the 82 Chibok girls. ABOVE RIGHT: A cross-section of the girls. BELOW RIGHT: Members of the BBOG jubilating yesterday. The girls were abducted from Government Girls Secondary School Chibok, Borno State, about four years ago. He joined the Borno State government, parents of the children and Nigerians in commemorating the fourth anniversary of the sad incident, praying that the event at the daughters’ school will go well. The President also urged the parents to keep their hopes alive on the return of their daughters, noting that the recovery of more than a 100 of the girls that were kidnapped through the Federal Government’s determined effort should give confidence that all “hope is not lost”. He re-affirmed that the government remained focused and determined to see the girls return to their homes, urging the parents to be expectant of more good news in due course. According to him, “We are concerned and aware that it is taking long to bring the rest of our daughters back home, but be assured that this administration is doing its very best to free the girls from their captors. “Unfortunately, the negotiations between the government and Boko Haram suffered some unexpected setbacks, owing mainly to a lack of agreement among their abductors, whose internal differences have led to a divergence of voices regarding the outcome of the talks. We know that this is not the news parents want to hear after four whole years of waiting, but we want to be as honest as possible with you. “However, this government is not relenting. We will continue to persist, and the parents should please not give up. Don’t give up hope of seeing our daughters back home again. Don’t lose faith in this government’s ability to fulfill our promise of reuniting you with our daughters. President Buhari assured that as long as he remained the Commander-in-Chief of the Armed Forces the Chibok girls will never be forgotten and that all would be done to have them reunited with their families. 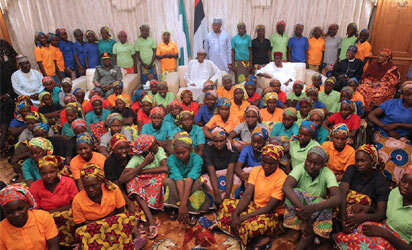 The post We are concerned; aware that it is taking too long, Buhari tells parents of abducted Chibok Girls appeared first on Vanguard News.